The recital module does not have a direct functionality to add an intermission. The work around to this is to add a performance to the recital called "Intermission" and add the number of minutes as the song name. No classes/students are added to this performance. 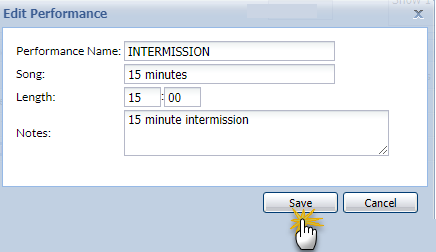 Note: When you check for conflicts Jackrabbit doesn't recognize the intermission as a performance because you didn't add students, but it is easy to see the conflict between the song before the intermission and the song after.